If you are searching for fence installation services in the Shiloh, Illinois, area, look no further than Chesley Fence & Deck. Since 1967, we have installed numerous quality fences for many happy customers throughout the area. In fact, our team of in-house fence installers – never subcontractors – has placed more fencing than any other company in the region, making us the most experienced and reliable choice for all your fencing needs. Vinyl – If you are looking for low-maintenance fencing, this is the option for you. Our American-made vinyl fencing is also exceptionally durable and will not fade or become discolored throughout the years. Aluminum – Our aluminum fencing is perfect for homeowners who want a sleek, durable fence. This fencing option is manufactured with no visual rivets or screws and will not flake or chip. Unlike other aluminum fencing, installation of this fence allows for the pickets to be installed two inches apart in order to keep even your smallest pets from escaping the yard. Western red cedar – This wood fencing does not crack or easily break and will even resist warping, unlike other treated lumber. Western red cedar also has a natural, attractive appearance to match the beauty of your home and backyard. 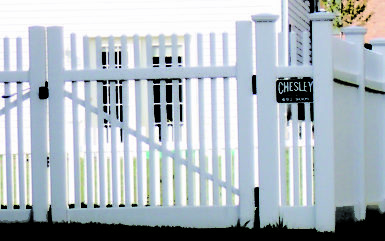 Chesley Fence & Deck can also custom design the fence product of your choosing. But no matter how you would like your fencing to look, our fence installation team will be able to get the job done right. 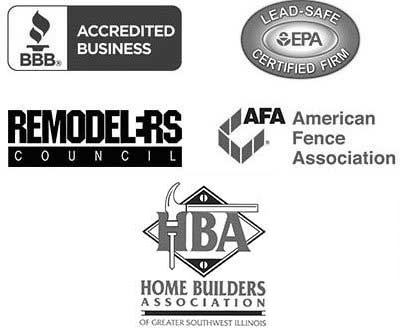 Contact Chesley Fence & Deck today to see why our fence installation team has been in the business longer than almost any other company in or around Shiloh, IL.